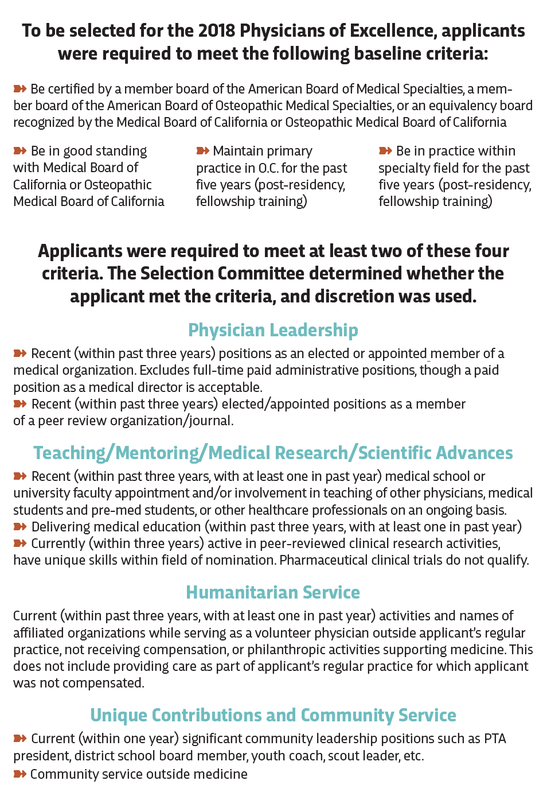 See the list of all 513 Physicians in 68 Specialties selected by the Orange County Medical Association for 2019. Tony Adkins is a physician assistant whose videos of dancing with pediatric patients went viral. Kelli Collins shifted her priorities after a terrifying diagnosis. Chris Marten turned his life around after brain surgery stopped his daily seizures. When Somaya Ishaq was told she had a 95 percent chance of getting ovarian cancer, she decided to be proactive. Matthew Belden describes the miraculous recovery of his 12-year-old son after a snowboarding accident last year. Natalie Grumet suffered a gunshot wound to the face in the deadliest mass shooting in modern U.S. history. Chapman awarded Judy a surprise honorary MBA at her son's graduation in June. She immediately understood that Doc was just like her. OCMA's complete list of 504 O.C. Physicians in 69 Specialties. Is your doctor on the list? Six million people have viewed (the music video) on Facebook. SEE THE LIST OF ALL 513 TOP DOCS!